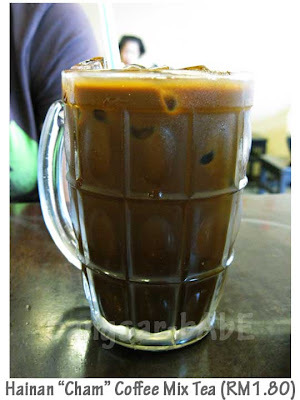 Last weekend, I went for brunch with my family at Old Time Old Taste in Pudu. 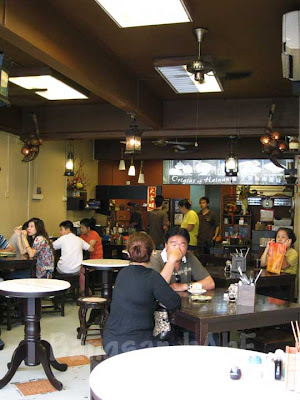 Located one street away from Pudu Plaza shopping complex, this cafe serves home-cooked Hainanese fare at affordable prices. Jessy Mok, who is both ambitious and friendly, runs the place. The antique lamps on the ceiling lend a nostalgic feel to the place, and a few wooden and marble top tables complete the clean decor. Since she knows best, we went with all of Jessy’s recommendations. 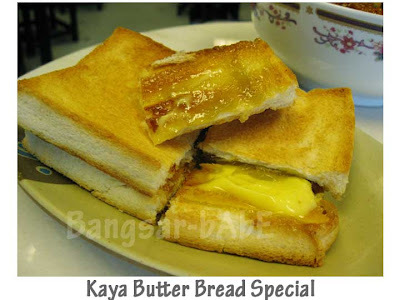 The wholemeal bread with kaya butter (RM2.10) was quite good. Nicely toasted on the outside, it came with a copious amount of butter and kaya. Each bite left traces of butter and kaya at the sides of my mouth. I really enjoyed this, and ordered another serve. 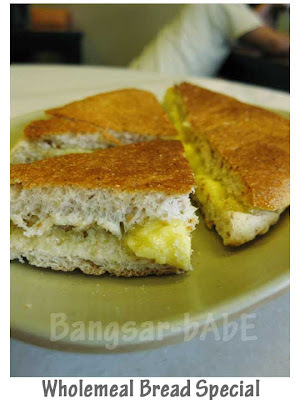 =) On the other hand, the kaya butter bread (RM2) didn’t impress me. The bread was over-toasted, making it too crunchy and biscuit-like. 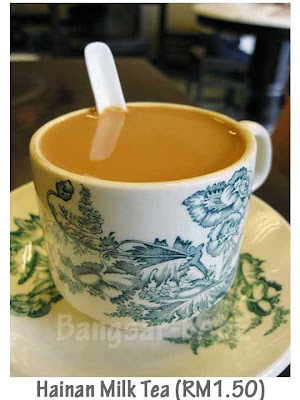 Dad’s Hainan Milk Tea was quite good. Thick, creamy and not overly sweet, it went very well with the toasts so I ordered one for myself too! I found the Hainan “Cham” average. While it was strong and fragrant, it was missing the “kao”. 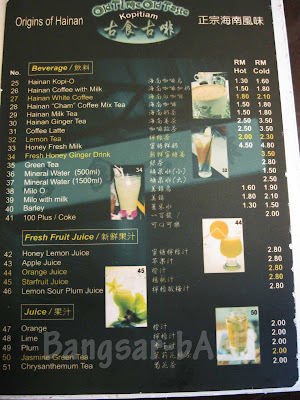 The Fresh Ginger Honey Drink was light and refreshing. I’m not a fan of ginger drinks, so I didn’t really care much for it. 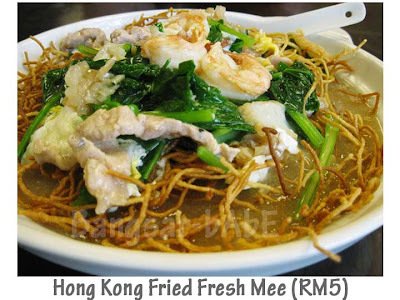 The Hong Kong Fresh Fried Mee was pretty good. Topped with 3 plump prawns, pork slices and greens in an egg-y gravy, I did not have to add any soy sauce or chili padi to it. It was good on its own! The portion is pretty big. A bowl like this can easily feed 2 small eaters and one of me! 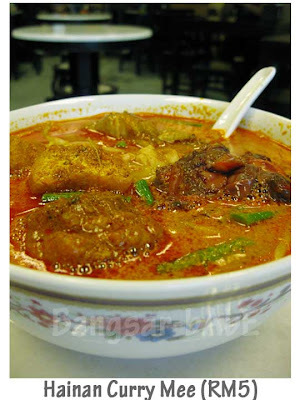 =D Served in a big porcelain bowl, the curry mee looked fiery and smelt delicious. I dug in and found lots of long beans, tau foo pok, juicy cockles and a whole chicken drumstick. The curry gravy was thick and aromatic. Tastewise, I thought it not spicy or salty enough. 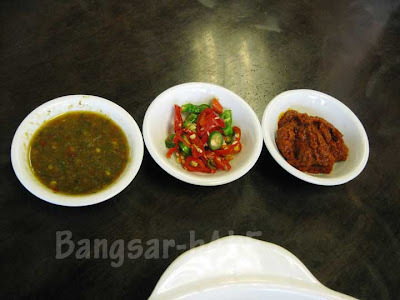 However, this was rectified with a dollop of sambal and a dash of soy sauce. My parents loved the pan mee. The pinched noodles were soft and slightly chewy at the centre, and the soup base was very ch’ng. 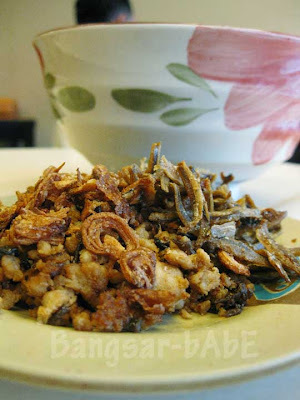 It came with a plate of crispy fried shallots, savoury minced pork and ikan bilis. Now, if you know me well enough, I’m not a huge fan of ch’ng soups. Discounting that, the pan mee was not bad, but nothing spectacular. 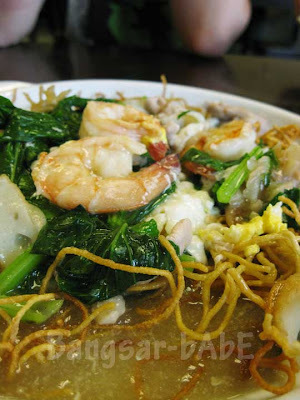 Topped with fried shallots, prawns, fish slices and beansprouts, the prawn mee didn’t quite hit it with me. 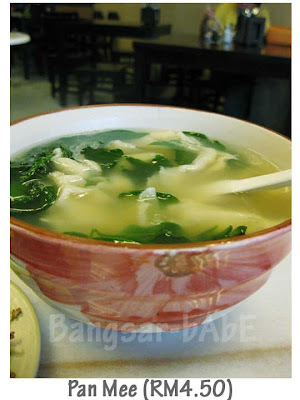 While they were generous with the “liu”, I found the soup base a little anaemic, both in taste and colour. On top of that, I like adding pork ribs into my prawn mee. 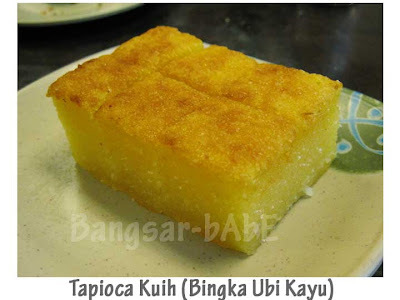 When we were done with the meal, Jessy came out with a plate of tapioca kuih (bingka ubi). The kuih had a soft and slightly sticky texture, and was not overly sweet. I thought it was not bad, except for the top part being under-caramelised. Neither my parents nor myself felt thirsty after the meal, so I reckon the MSG level in the food is low. 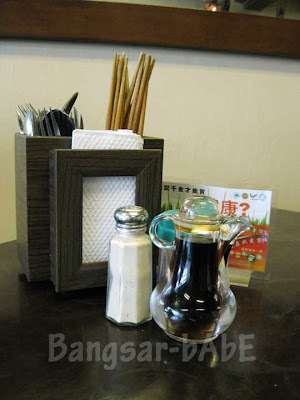 Give this place a try if you happen to be around the area and crave home-cooked Hainanese food. 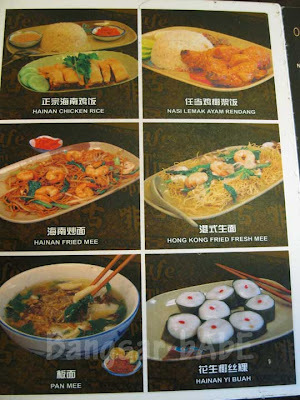 Verdict: Decent Hainanese fare and big portions at friendly prices. 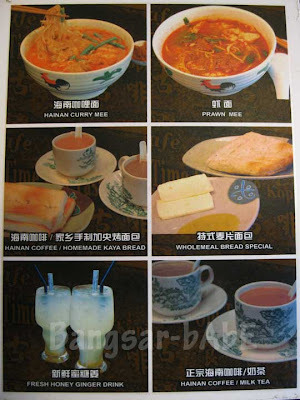 typical kopitiam fare, at best huh? 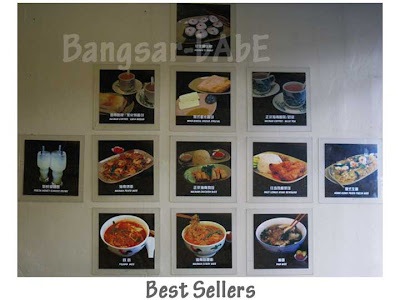 least more choices than THE original culprit which started this trend. i like the name..old time, old taste. wish the food was like that! Isn't it just fantastic !? All the oldies old quadruple seasons old familiar tastes old young power bodies coming back with a vengence like a blistering MegaStorm ! Even sweet young voluptious pretties like weknowwho loves so very much ! OMG ! Welcome to da Club , Old & Strong 4ever ! u didnt go eat siew yuk!!??? 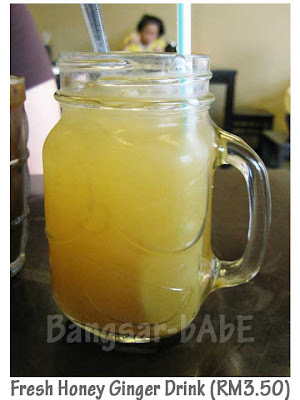 SimpleGirl – Yup, Sang Mee was not bad. Dad wanted to try this place cos his friend recommended it. Haha…I get what you mean. 😉 I felt the same when I was away, and would happily devour anything remotely Malaysian!! hey for the price it is pretty good! 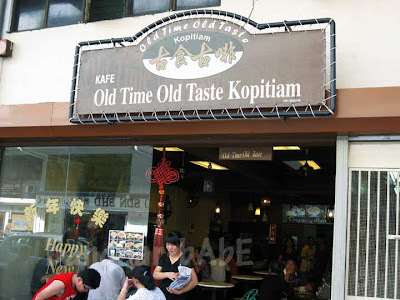 and the shop name old time old taste kopitiam sounds just so generic.